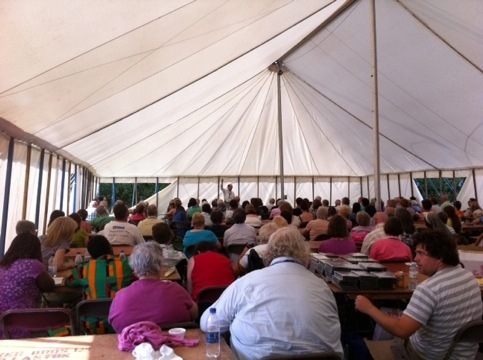 Having a great time with on-fire Catholics at the Walsingham Marian Shrine in England. This shrine started in 1061 and was visited by most of the English kings until it was destroyed by King Henry VIII. Imagine – Catholics have been taking pilgrimages in the thousands for 1,000 years! More than three times older than the United States. These are hungry Catholics starved for the truth. 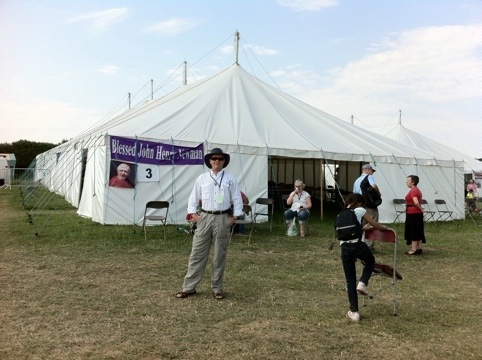 Anglicans and other Protestants are converting en masse. A great joy to proclaim the Catholic faith here. Little time to write now due to poor Internet. To see my runs thru the quaint and beautiful countryside to the shrine and Priory visit the two links directly below. I like this. 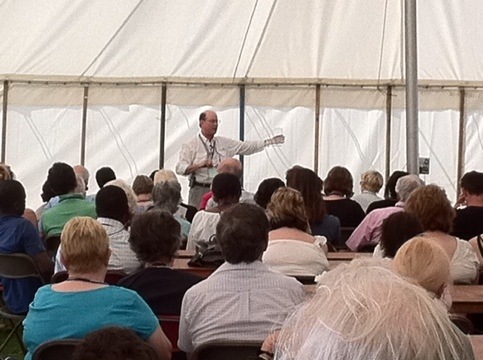 Revivalist-style tent meetings for Catholics is nothing to sneer at. Thanks for coming and talking to us, Steve. As a cradle Catholic, I am embarrassed how little I, and many of our fellow Catholics, know about the bible or about how to defend ourselves against those who want to save us from the papal antichrist. I got home on Friday night and, at Saturday evening Mass, a girl I know was leafing through a bible during Mass. I had taken my bible to Mass (for the first time ever), so she and I sat down after Mass and I ran through the Ark of the New Covenant bible study with her. It was great fun for both of us and watching the light switch on as I asked “so, who is Mary?” was a moment to cherish. I plan to do some more studying, and to lead some more bible studies at church and to carry on spreading the word. I’ve just returned home from this conference.Up until 2 years ago i had lived in Walsingham for 17 years and annually attended New Dawn.I have to say i have rarely been more inspired by a speaker than i was this year by Steve Ray!I was present at all his talks and was truly fired up by the content and delivery of them all!All Catholics…All Christians…indeed ALL people seeking THE TRUTH need to hear him! !The time is NOW! Thankyou Steve for all you have done and are doing ……May God Bless you and may Our Lady protect you and your family always.